Within this framework, there are two possible roads to reconciliation between science and religion. One is to claim that science and religion are not incompatible because they speak to completely distinct sets of questions, and hence never come into conflict. The other is to assert that thinking scientifically does not lead to rejection of theism, but in fact that religious belief can be justified in the same way that any scientific theory might be. I will argue that neither strategy succeeds: science and religion do speak to some of the same questions, and when they do they get different answers. In particular, I wish to argue that religious belief necessarily entails certain statements about how the universe works, that these statements can be judged as scientific hypotheses, and that as such they should be rejected in favor of alternative ways of understanding the universe. På detta tema, se även professorn i biologi Jerry Coyne. Inte minst religiösa världsbilder brukar bygga på föreställningen att människan och hennes tillvaro är så speciell. De verkar bygga på skakig grund. Det ska bli ytterst intressant att följa denna forskning framöver, inte minst av följande skäl: Om universum inte har en början faller det kosmologiska ”gudsbeviset” platt till marken. 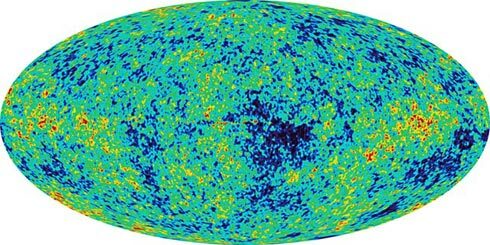 Se även ﻿﻿”Har universum skapats av en gud?”﻿, ﻿”Universums tillkomst”﻿, ﻿”Bevisar Big Bang att Gud finns?”﻿, ﻿”Vetenskapligt bevis för Guds existens?”﻿, ﻿”Började universum existera?”﻿, ﻿”En första orsak?”﻿ och ”Nya insikter om universum”﻿. (P1) The combination of physical constants that we observe in our universe is the only one capable of sustaining life as we know it. (P2) Other combinations of physical constants are conceivable. (C3) Therefore, some explanation is needed why our actual combination of physical constants exists rather than a different one. 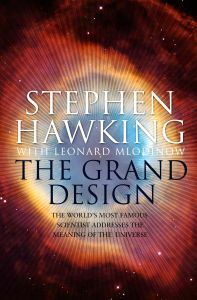 (P4) The very best explanation of the given fact is that our universe, with the particular combination of physical constants that it has, was created out of nothing by a single being who is omnipotent, omniscient, all-loving, eternal, and interested in sentient organic systems, and that he ”fine-tuned” those constants in a way which would lead to the evolution of such systems. (C6) Hence [from (P4) & (P5)], there is good evidence that God exists. Why alpha takes on the precise value it has, so delicately fine-tuned for life, is a deep scientific mystery. A new piece of astrophysical research may, however, have uncovered a crucial piece of the puzzle. In a paper just submitted to Physical Review Letters, a team led by John Webb and Julian King from the University of New South Wales in Australia present evidence that the fine-structure constant may not actually be constant after all. Rather, it seems to vary from place to place within the universe. If their results hold up to the scrutiny, and can be replicated, they will have profound implications—for they suggest that the universe stretches far beyond what telescopes can observe, and that the laws of physics vary within it. 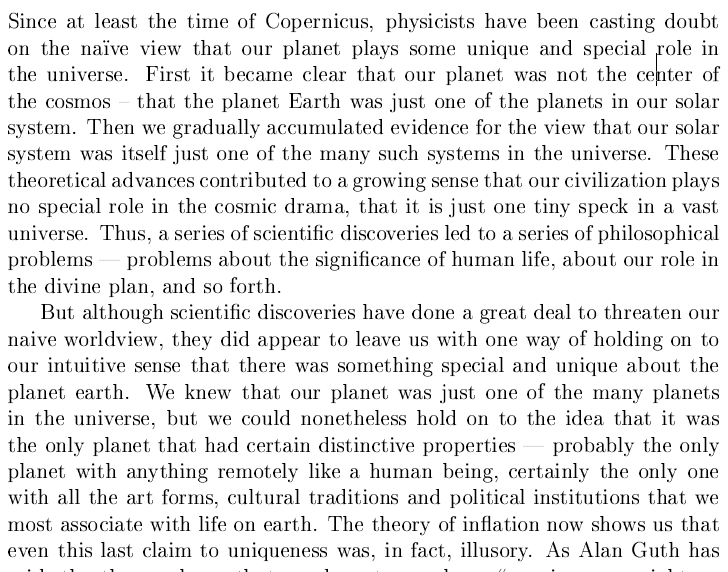 Instead of the whole universe being fine-tuned for life, then, humanity finds itself in a corner of space where, Goldilocks-like, the values of the fundamental constants happen to be just right for it. (C3) tycks dubiös om denna teori stämmer, eftersom andra α-värden då faktiskt existerar i andra delar av universum. Vi råkar helt enkelt befinna oss i den del där värdet tillåter liv; på annat håll gör värdet inte det, och liv finns följaktligen inte heller där. Nå, det som slår mig är behovet av ödmjukhet. Det är så mycket om dessa komplexa och fundamentala frågor som vetenskapen inte har kunnat klarlägga. Se även ”Vetenskapligt bevis för guds existens?”, ”Är universum finjusterat?” och ”Bristfälligt gudsbevis”. According to this theory, the Big Bang was not the beginning of time but the bridge to a past filled with endlessly repeating cycles of evolution, each accompanied by the creation of new matter and the formation of new galaxies, stars, and planets. En intressant implikation av denna teori är att tillvaron faktiskt inte har någon början: den har i en fundamental mening alltid funnits. Det kosmologiska gudsargumentet (som för övrigt är ett typexempel på att postulera säker kunskap när ingen kunskap finns) faller därför t.ex. platt till marken.